At the start of each year we normally see some of the big hotel chains making changes to their loyalty programs. 2013 has been no different, in fact I would have to say there have been more changes than more and as is almost always the case the changes aren't good. Starwood Preferred Guest, IHG Priority Club, and Marriott Rewards have all released 'bad news' changes to their programs and now with an email yesterday came news of Hilton's turn. 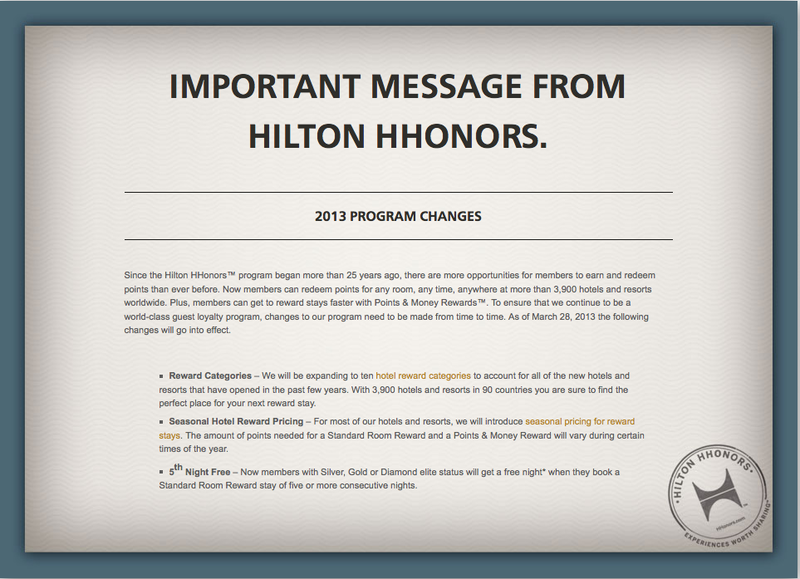 Out of all the programs that have announced changes, Hilton HHonors have got to be some of the most significant and not in a good way. 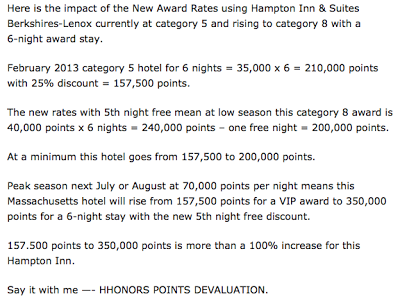 Hilton HHonors will be moving to 10 award categories from 7. The new categories are 8, 9 and 10 and primarily affect current Category 7 hotels which maxed out at 50,000 points for an award night. Now with the new categories some these hotels will cost as much as 95,000 points per night! Overall this is a huge devaluation for many of the 'dream' hotels that members aspire to redeem at and even for the not so 'dreamy' hotels that are in the middle of the award chart. One thing I didn't notice on many of the other Frequent Flyer and Loyalty Blogs is that the Category 1-3 hotels have actually gone down in the amount of points required but the reasons it is not mentioned is that there are a little over 500 properties in these categories out of Hilton's 3,900+ hotels inventory, so they make up a small portion of the pot and most people, like myself, save up points to redeem for aspirational awards, like stays at the 5 star on the beach locations, which never fall into the low categories. Also going down is the lowest rate possible for categories 5-7, obviously for stays during the lowest of low seasons. The final change is 5th Night Free, where members with Silver, Gold or Diamond elite status will get a free night when they book a Standard Room Reward stay of five or more consecutive nights. This 'new' enhancement will actually remove the current VIP Awards from HHonors which provided 20% off standard award rates for stay of 5 nights (so the equivalent of 5th night free) but also provided 15% off for 4 nights or even better 25% off of 6 nights. 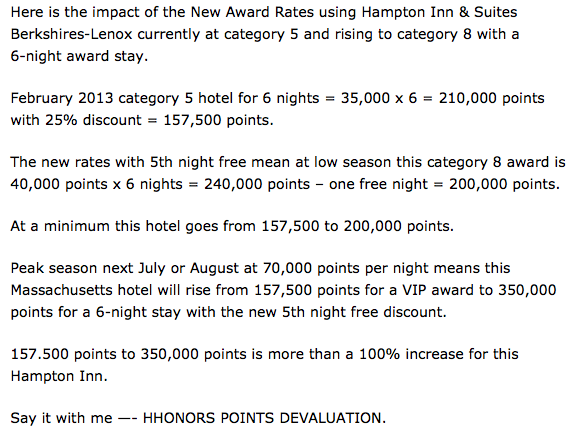 So the loss of the VIP Awards and the introduction of the 5th Night Free for elite members can also be considered a devaluation of the HHonors program. As always, for some good analysis please visit Ric Garrido's Loyalty Traveler blog where he puts up some sample reward bookings under the current HHonors program and the program after March 28th. It doesn't look good. 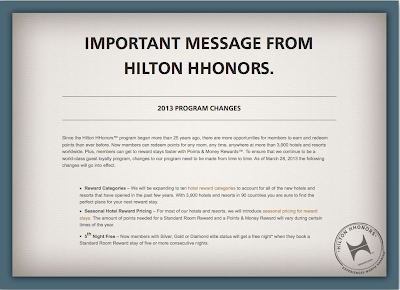 Are you a big time user of the Hilton HHonors program? I'm not so much so I'd love to hear comments from those of you who are going to be majorily affected by these changes! I am a diamond member at the Hilton, not happy with the latest "move", but who is happy when anything goes up and you lose any benefit. I have had many good upgrades at the Hilton, including my recent stay in Las Vegas. Most of hhe hotels are great, and I am still a loyal customer! Glad to hear the program has worked and will continue to work for you!